When we heard the news of what could be the worlds biggest dinosaur find, we thought we would share our excitement with you. Scientists have discovered the bones of a mega dinosaur in Patagonia Argentina on an archeological dig. The huge beast may be as tall as a seven story building. How Big Could This Dinosaur Be? 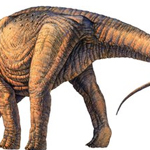 Although the dinosaur bones need to be studied in further detail initial measurements mean this dinosaur may weigh the same as 14 fully grown elephants, be 40 metres long and 20 metres tall. This plant eating dinosaur lived in the forests of Argentina between 95 and 100 million years ago – amazing! We’d love to hear your ideas for names for the dinosaur so please let us know!